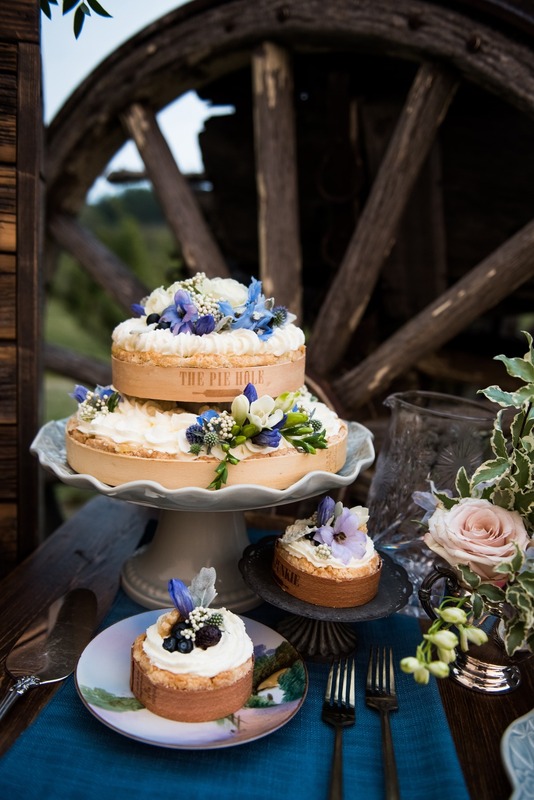 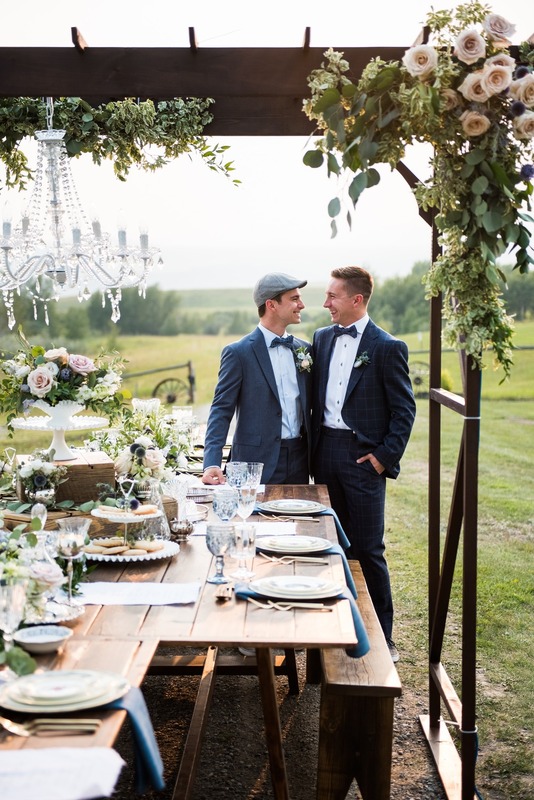 The rolling foothills of Southern Alberta was the idyllic setting for this refined country inspired shoot styled by Nicola Osse Event Management and Tables By Design. 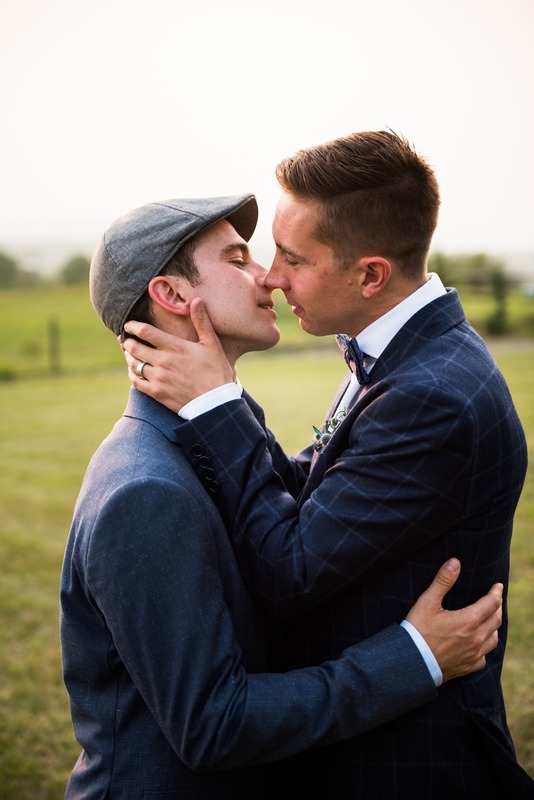 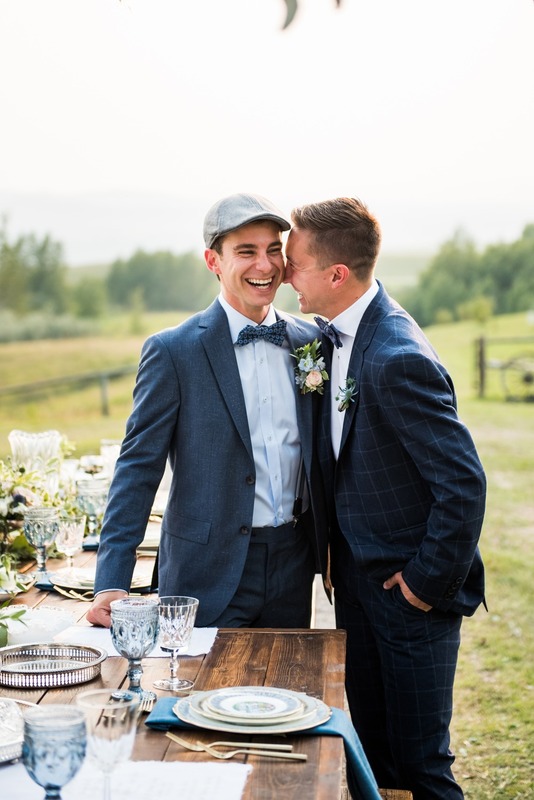 Paisley Photography along with a group of vendors showcased their talents at putting together this rustic opulent wedding for the Mr. and Mr., and we're loving the beauty of it all. 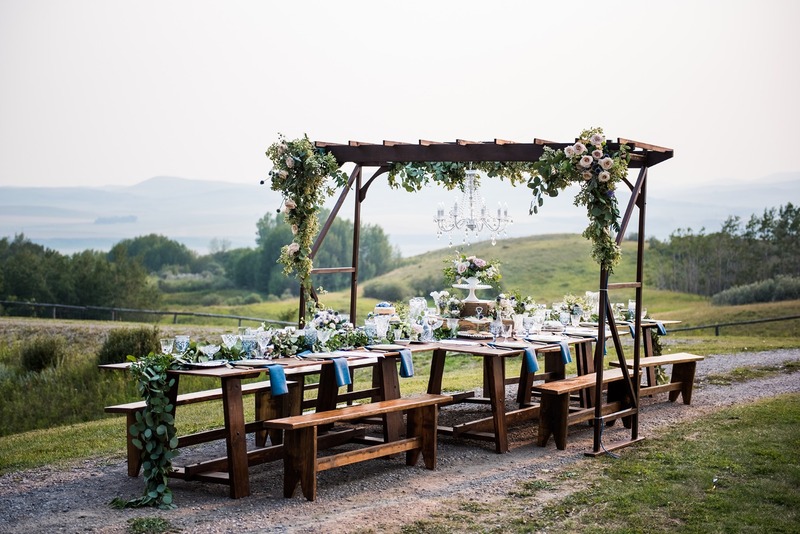 Rustic, vintage decor are paired with more modern details to create the elegant setting you’re about to behold. 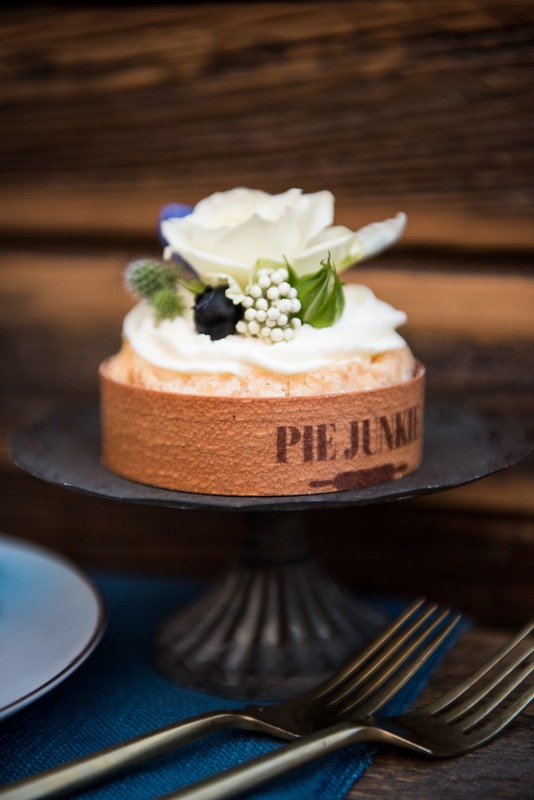 Dreamy lighting, the sweetest pies from Pie Junkie, and a “Mad Men” inspired bar are just some of the highlights below, so keep scrolling and find more details in the full gallery. 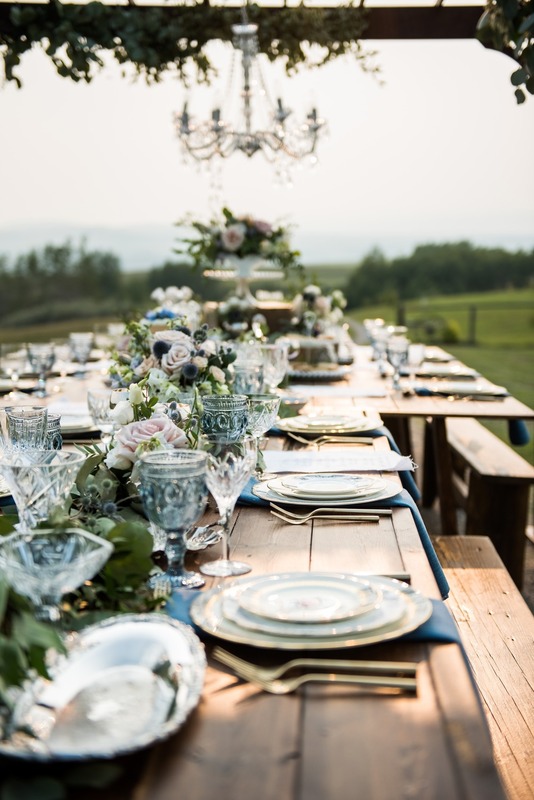 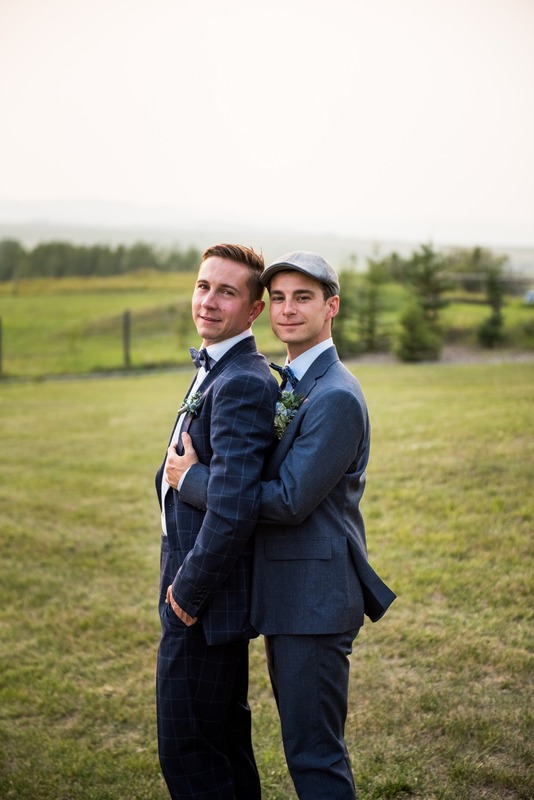 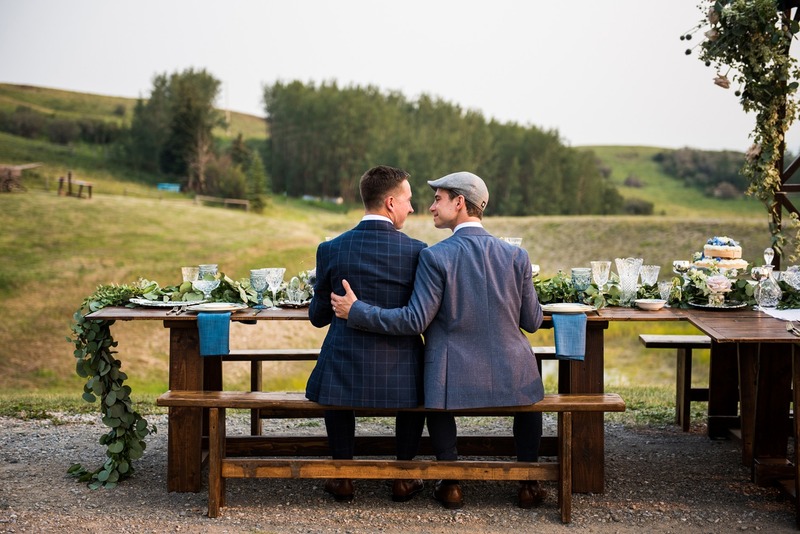 From Paisley Photography: Rustic opulence is the theme of this wedding inspired shoot located on an acreage in the rolling Foothills region of Southern Alberta. 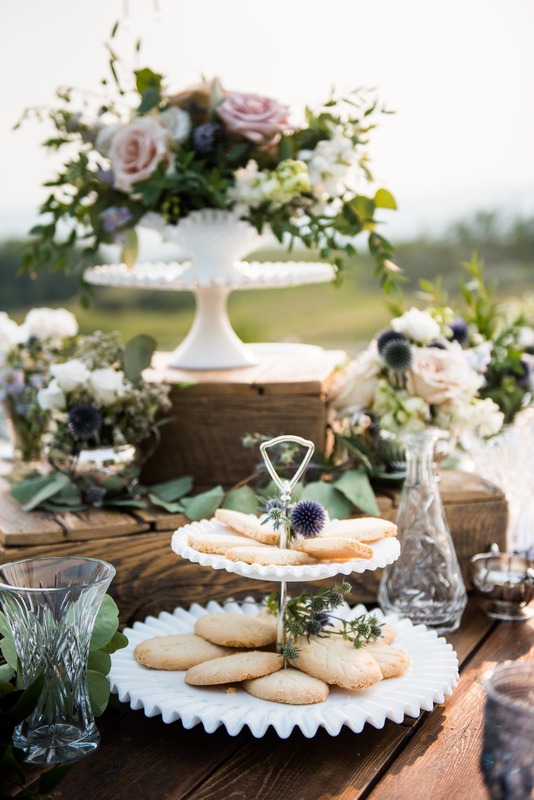 This refined take on a country wedding reveals elements of an era in the past, combined with the elegance of a modern setting. 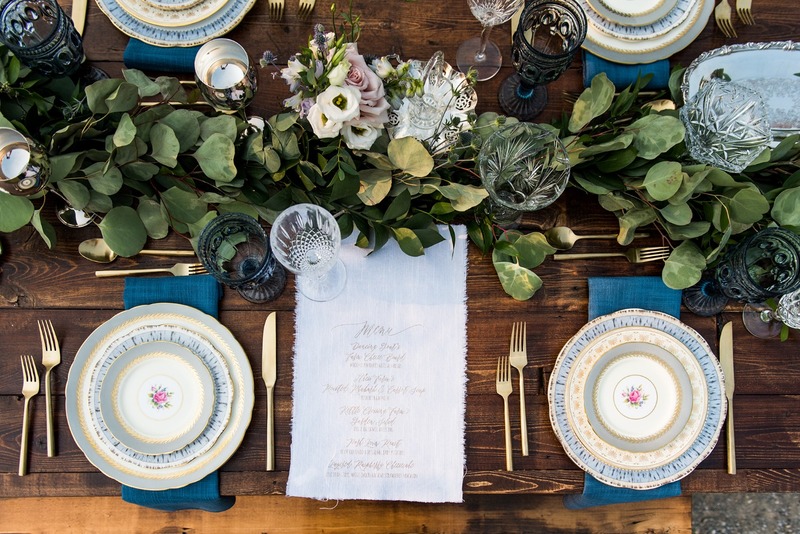 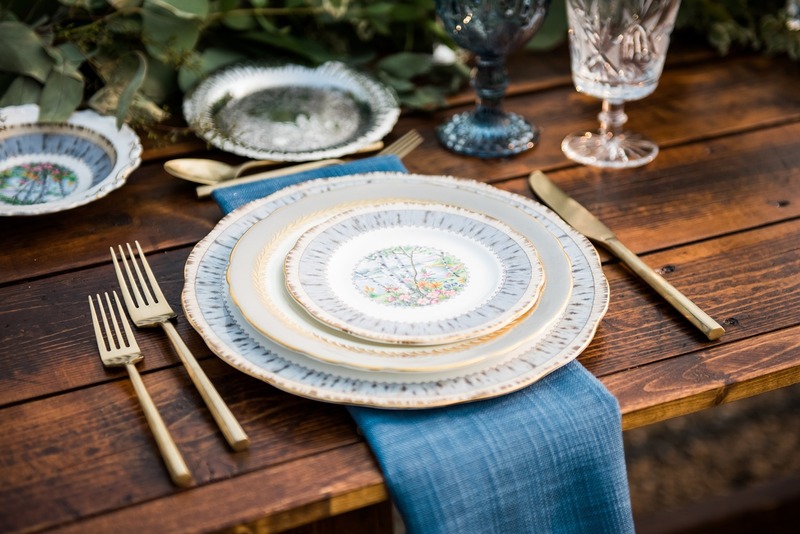 The tablescape shows off an elegant “formal” appeal while dressed with vintage and rustic flair. 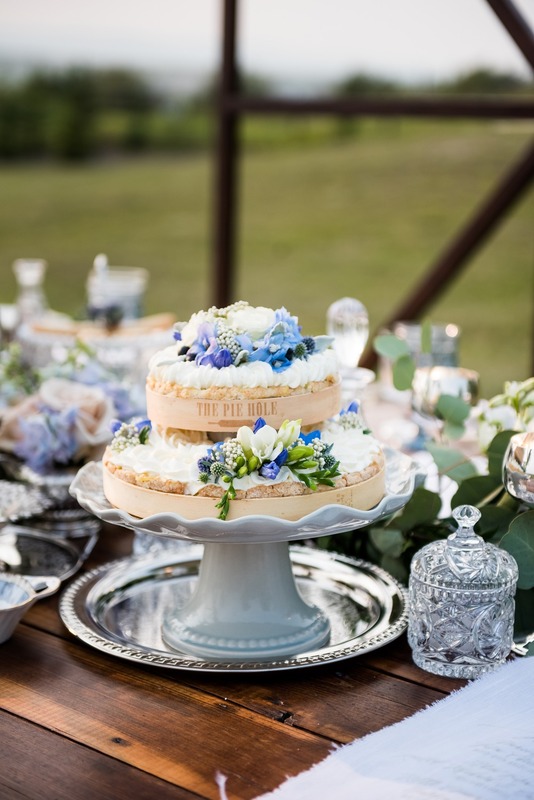 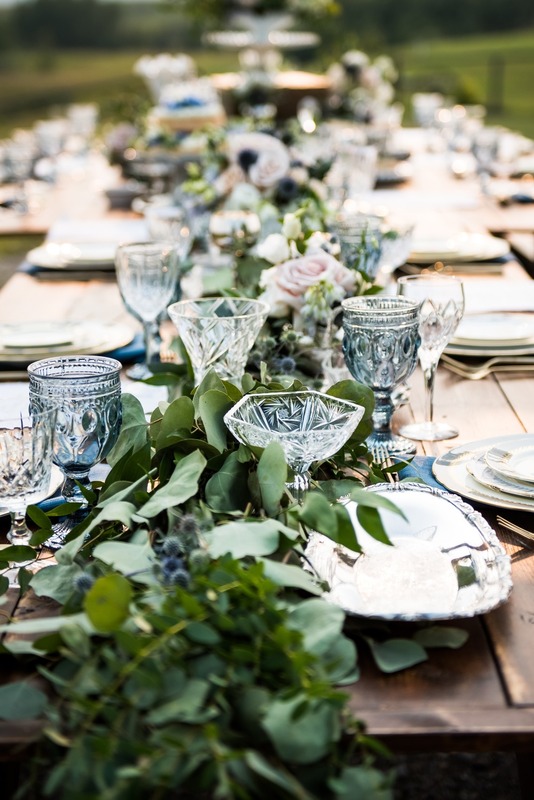 The tableware gives the appearance of a grand formal dinner, while the floral centerpiece brings it back to the countryside with hints of blue, blush and ivory throughout. 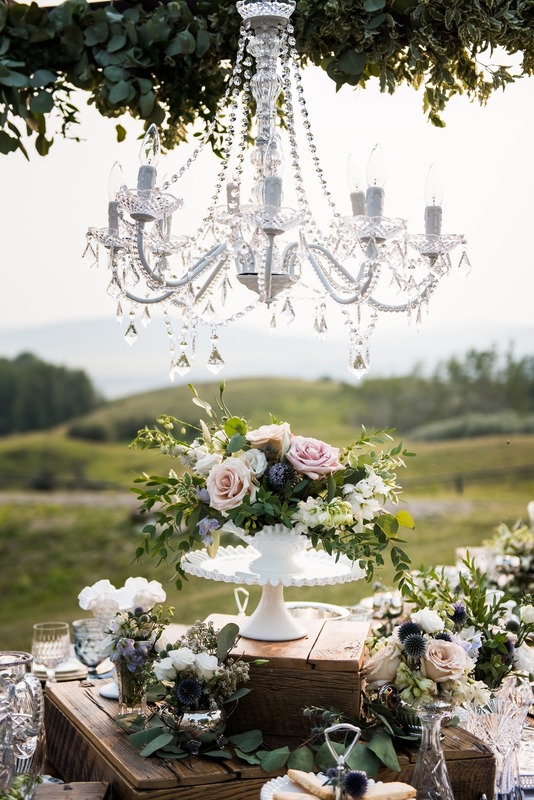 A dramatic pergola in the center draped in blush roses and greenery, reveal a dazzling crystal chandelier to complete the formal dining effect, all while staying true to the country nature of the shoot. 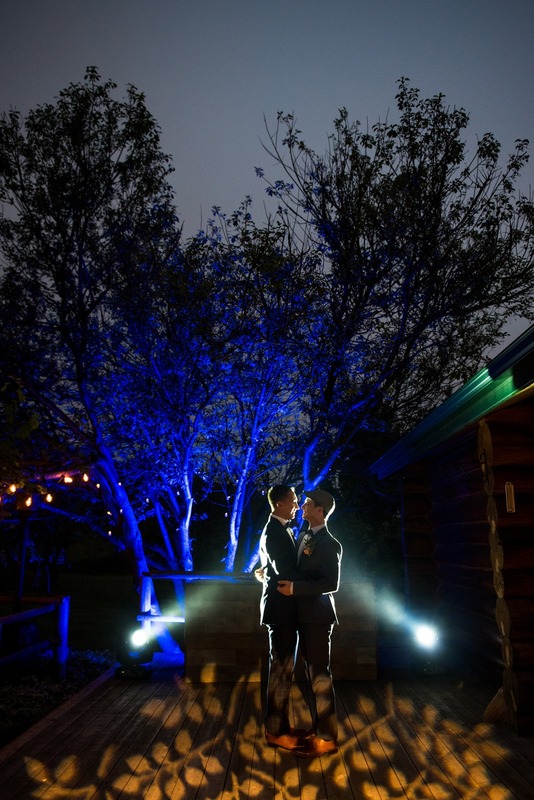 Dramatic lighting for the evening help creates a stunning change in appearance. 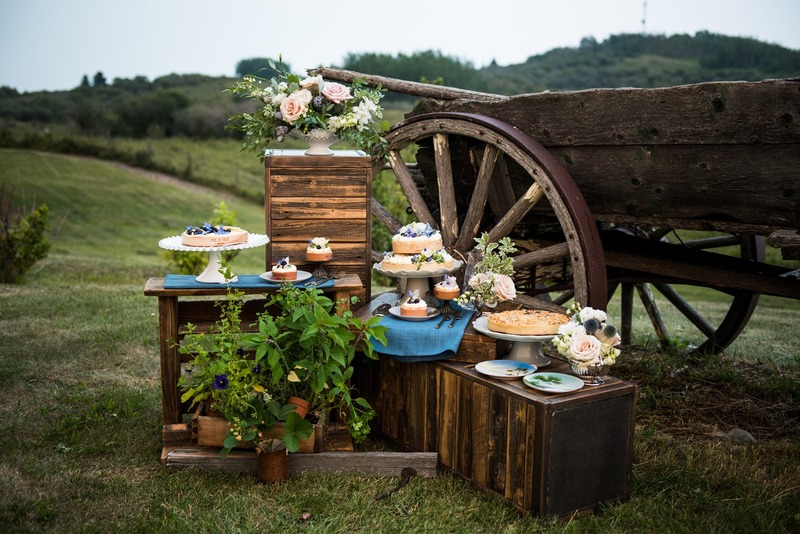 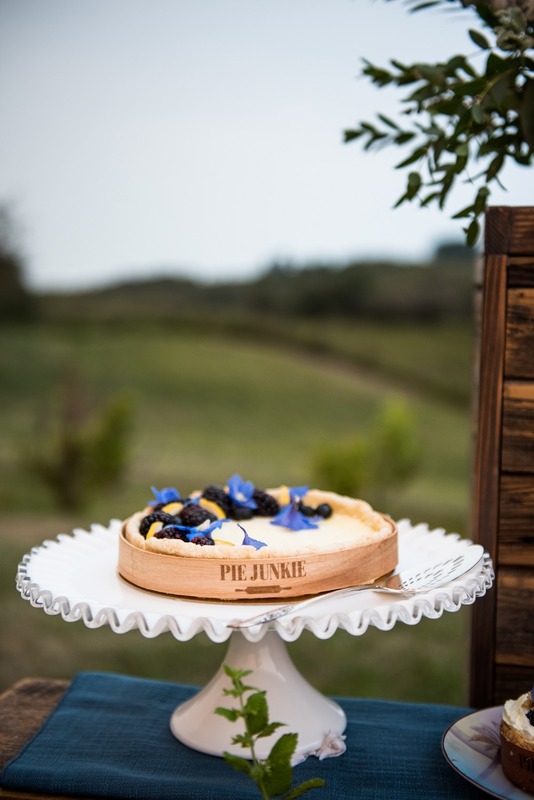 Linen menus, wedding pie and elegant floral arrangements all help contribute to this rustic opulent theme. 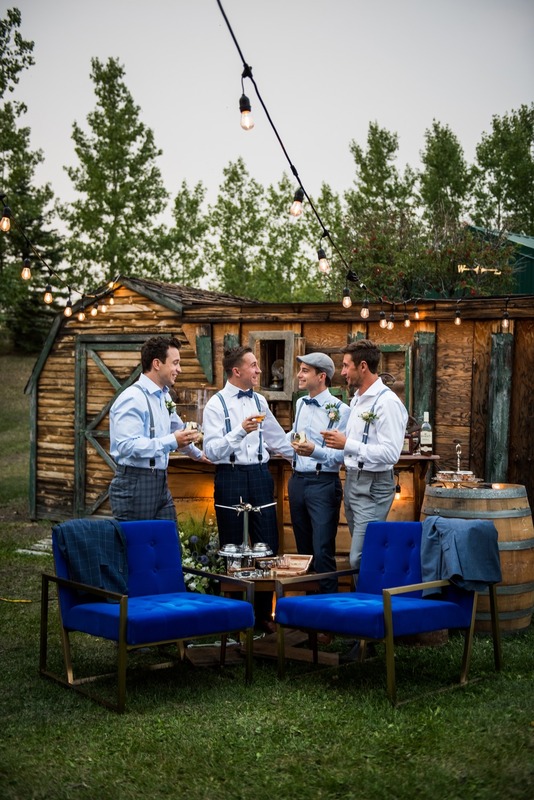 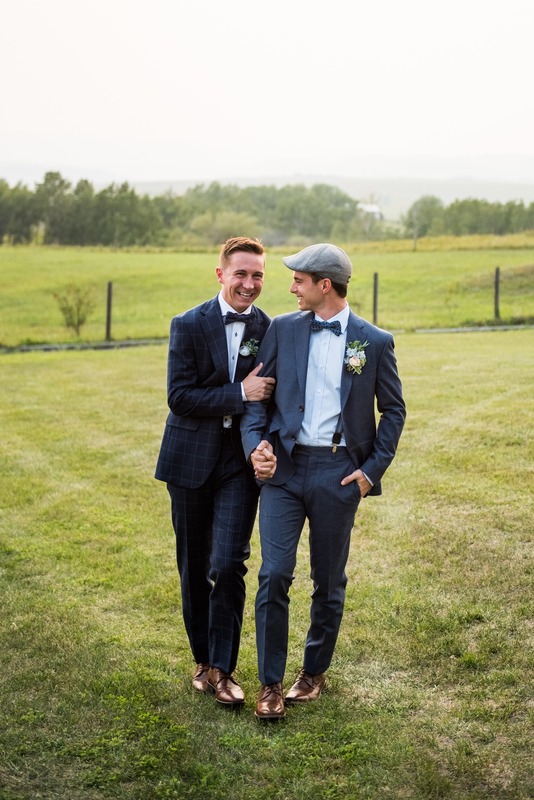 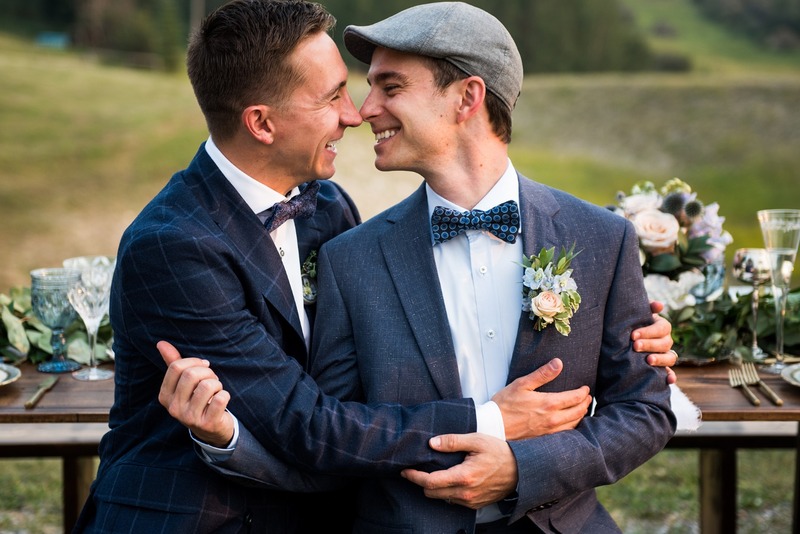 The groomsmen were dressed in blue formal attire and adorned with patterned blue bow ties to match each other. 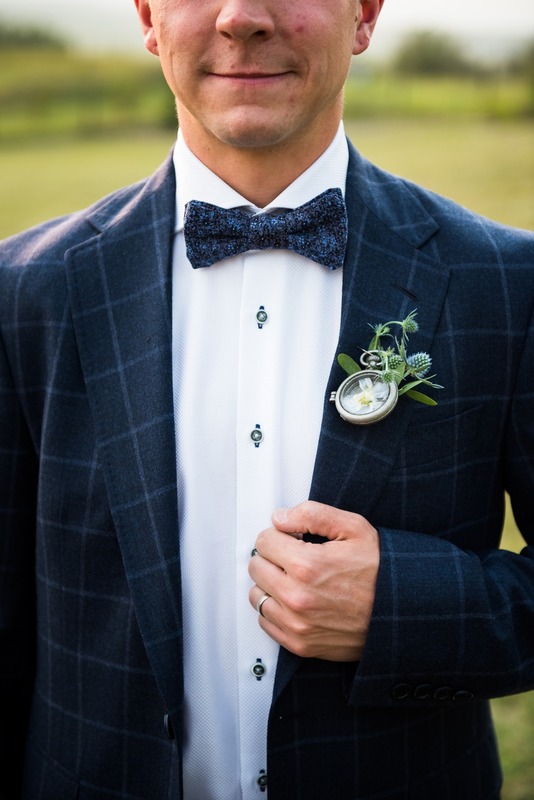 A boutonnière styled with an old pocket watch created a beautiful alternative to a traditional floral piece. 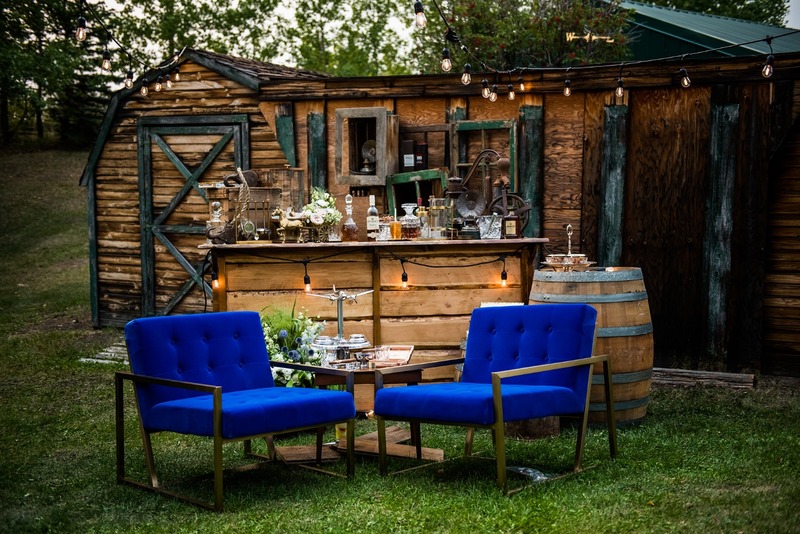 The bar area has a “Mad Men” type of feel to it while maintaining elegance with a pop of blue color in the oversized blue lounge chairs. 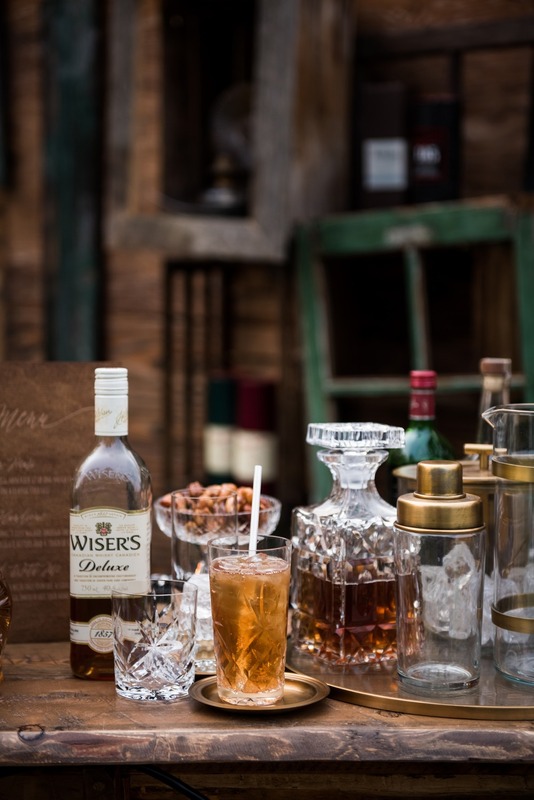 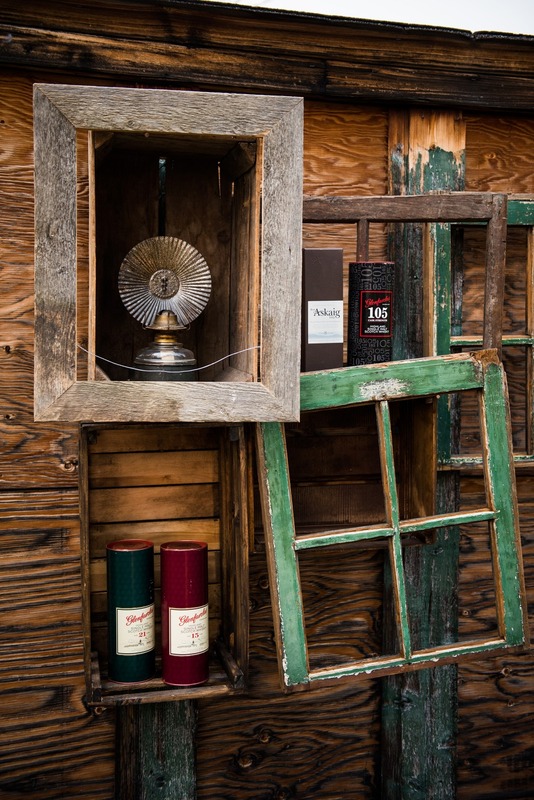 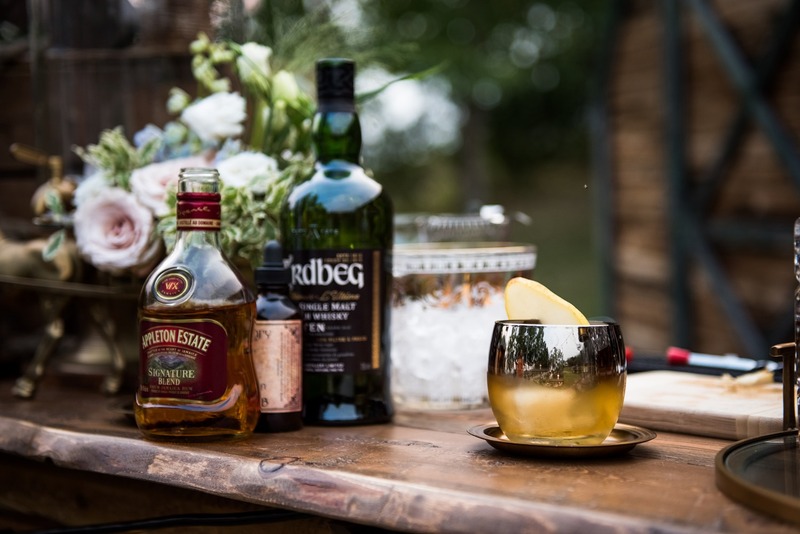 Touches of masculinity in such items as a men’s grooming kit, whiskey, cigars, and airplanes help create that vintage vibe by tying into the brown shades in the wooden barn and window frames. 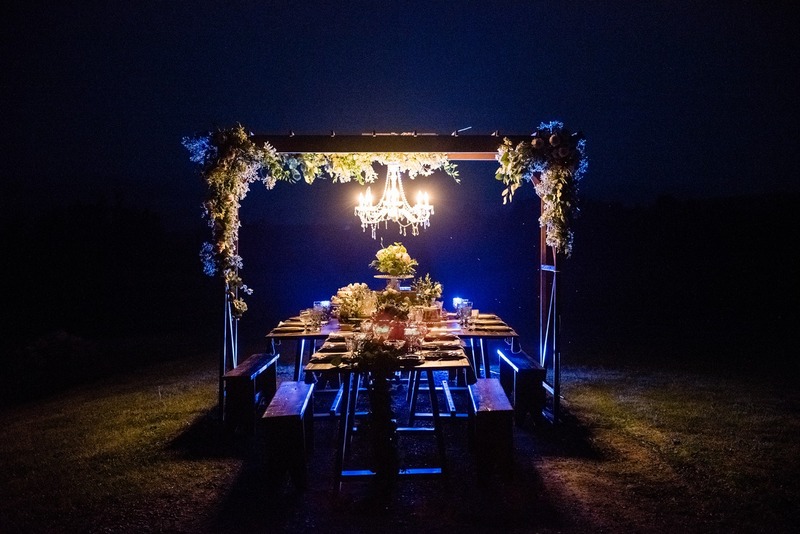 A rustic and opulent inspired wedding for any bride or groom wanting to maintain a country vibe without losing elegance.